*Best of 2003 Award: Barnes and Noble.com, The Oakland Press, RT BOOKclub Magazine. Nominated for a Holt Medallion. Winner of the National Reader’s Choice Award for best long historical romance. Bestselling author Pamela Britton blames her zanny sense of humor on the amount of Fruity Pebbles she consumes. Not wanting to actually have to work for a living, Pamela has enjoyed a variety of odd careers such as modeling, working for race teams--including NASCAR's Winston Cup--and drawing horses for a living. Over the years, Pamela's stories have won her numerous accolades. In 2004 alone her novel, Seduced, was named one of the best romances of 2003 by the staff of Barnes and Noble.com, The Oakland Press, RT BOOKclub Magazine, and Romance Readers at Heart. Seduced also won a National Reader's Choice Award for best long historical romance, and was nominated for a HOLT Medallion. One might think this would give Pamela a very big head when, in fact, she's kept humble by the laundry, scooping manure and a precocious four-year-old who's not impressed mommy "colors books". Pamela feels privileged to write full-time from her ranch in Northern California where she lives with her husband, daughter and, at last count, fifteen four-legged friends. Pamela's IN THE GROOVE is the first work of fiction ever licensed by NASCAR. Pamela's most likely the first romance novelist ever profiled in SPORTS ILLUSTRATED. Pamela used to be a frequent guest on the Bay Area’s KRTY radio station where she took on the laughable job of writing a romance on the air with the help of listeners. JELLY FILLED LOVIN’ has yet to hit any bestseller lists. Pamela was an occasional ‘scorer’ for the NASCAR SuperTruck series, which makes it sound like she used to date race car drivers, but really means she kept track of the elapsed seconds for race trucks when they crossed the start/finish line. Her first live television appearance was in 2002. Much to her amazement she did not tumble off the stage, inadvertently collapse the set, nor stare dazedly into the camera due to stage fright. Since then, there’ve been many other television appearances. MOST EMBARASSING MOMENT: Forgetting the words to the National Anthem while in the middle of singing the song before a packed audience. She’s a multiple state champion for California State Horseman’s Association. Some of her first readers when she was unpublished were the wives of famous race car drivers. She sold her first book less than two years after she started writing, an almost unheard of feat in the publishing industry. Pamela draws horses. In fact, many of her portraits are in private collections throughout the United States. MOST EMBARASSING MOMENT #3: Striking up a conversation with a man in between classes at a horse show and explaining how much she despised baseball, only to find out later that he owned the Oakland As. Harlequin Enterprises and NASCAR Announce Licensing Agreement Toronto, Ontario, and Daytona Beach, Florida, November 2, 2005 - Harlequin Enterprises Limited, one of the world's leading publishers of women's fiction and the global leader of series romance and NASCAR, the largest sanctioning body of motorsports in the United States, today announced a new licensing agreement. Under the agreement, Harlequin will publish a variety of women's fiction titles that will be included in the NASCAR Library Collection, which provides a high level of authentication and quality to NASCAR-licensed books. The novels, by some of Harlequin's bestselling authors, will have plotlines centering on NASCAR and will bear the NASCAR brand on their covers. Harlequin will also be the first publisher of women's fiction for NASCAR. The debut title in the new program, IN THE GROOVE by award-winning author Pamela Britton, will be published on January 31, 2006 to coincide with the Daytona 500. IN THE GROOVE will be the first fiction title ever published as part of the NASCAR Library Collection. "We are thrilled to be NASCAR's first partner in fiction publishing and to bring our entertaining and enriching editorial to its audience," said Donna Hayes, Publisher and CEO of Harlequin Enterprises. "NASCAR has one of the largest and most loyal bases of female fans of any sport in the United States and we are delighted to publish novels that will appeal specifically to them." "NASCAR continues to attract more and more female fans," said Mark Dyer, NASCAR Vice President of Licensing. "They are an enthusiastic and loyal group who possess a unique intensity in regards to the sport. The new NASCAR Harlequin titles should be a real attraction for this segment of our fans." NASCAR counts 75 million people-40% (30 million) of which is made up of women-among the sport's rapidly growing fan base. NASCAR fans evince strong brand loyalty-NASCAR ranks first among all sports-and their fans are three times more likely to buy NASCAR-licensed products. In 2004, Harlequin sold 130 million books and had 16 titles appear on the New York Times bestseller list for a total of 50 weeks. Forty percent of women's fiction readers read romance and approximately 1/6 of all adult fiction sold at retail stores are romances. Almost half of all romance readers read Harlequin and the company has some 13 million series readers. Harlequin Enterprises Limited is the global leader in series romance and one of the world's leading publishers of women's fiction, with titles issued worldwide in 25 languages and sold in 94 international markets. The company releases over 115 titles monthly and publishes more than 1,300 authors from around the world. 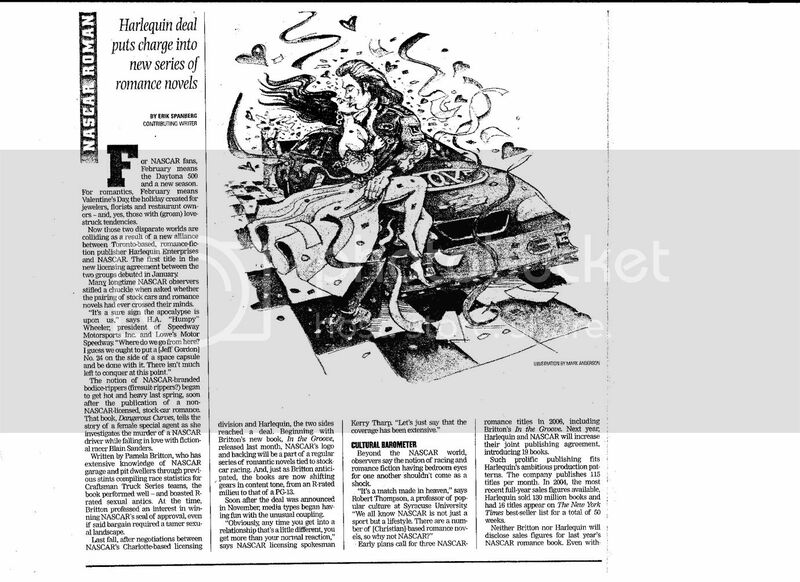 Harlequin Enterprises Limited is a wholly owned subsidiary of Torstar Corporation, a broadly based media company listed on the Toronto Stock Exchange (TS.nv.b). Harlequin's Web site is located at www.eHarlequin.com. Harlequin has offices in 18 countries including Toronto, New York and London. For more information please visit www.eHarlequin.com or press.eHarlequin.com. The National Association for Stock Car Auto Racing, Inc. (NASCAR), which began in 1948, is the sanctioning body for one of America's premier sports. NASCAR is the #1 spectator sport, holding 17 of the top 20 attended sporting events in the U.S., the #2 rated regular-season sport on television with broadcasts in over 150 countries and has 75 million fans who purchase over $2 billion in annual licensed product sales. These fans are the most brand loyal in all of sports and as a result, more Fortune 500 companies participate in NASCAR than any other sport. NASCAR consists of three major national series (NASCAR NEXTEL Cup Series, NASCAR Busch Series and the NASCAR Craftsman Truck Series), as well as eight regional series and one local grassroots series. NASCAR sanctions 1,500 races at over 100 tracks in 38 states, Canada and Mexico. Based in Daytona Beach (Fla.), NASCAR has offices in Bentonville (Ark. ), Charlotte (N.C.), Concord (N.C.), Conover (N.C.), Los Angeles, New York, Mexico City and Toronto. A division of NASCAR's overall licensing operation in its Charlotte office, NASCAR Publishing currently oversees more than 30 licensed publishing partners and more than 100 NASCAR-licensed titles in print. In 2004, NASCAR launched the NASCAR Library Collection which provides a level of authentication and quality to NASCAR licensed books. This year the NASCAR Library Collection will release more than 40 titles, including books and magazines for both kids and adults. NASCAR Publishing highlights include working with well-known brands, including "Chicken Soup for the Soul" and the ".for Dummies" series, as well as licensing relationships with The Sporting News, Publications International and many other leaders in the publishing industry.